The Silver Surfer is one of those superheroes who’s always looked cooler than he actually was. The character’s visuals point to an ideal of unfettered freedom and navigating the cosmos with a slick, frictionless ease. But, in the main, the actual stories featuring the former herald of Galactus have had him weighed down by guilt and responsibility. He was never a “hang ten, dude” kind of character. But the latest series featuring Norrin Radd make him a lot more fun. Gloomy, shakespearean soliloquies have been the Silver Surfer’s stock in trade. He started his fictional life as Norrin Radd, a scientist on the idyllic planet of Zenn-La. When world-devourer Galactus came to Zenn-La to make it his next meal, Norrin offered his own life as a sacrifice, pledging to help keep the always-hungry entity fed with a steady supply of planets. He did that for ages, until he rebelled against his master to save Earth from getting broken down into a smoothie of life force energies. Galactus erected a barrier that stopped the Surfer from leaving Earth, and the former herald killed time pining after old girlfriend Shalla Bal and begrudgingly protecting the inhabitants of the less-advanced planet he was trapped on. After he was freed from that cosmic cage, Norrin Radd soared through the galaxies as a cosmic defender of life and justice. He was a lot more well-adjusted but still seemed to lean towards the depressive side of the psychological spectrum. Drama is necessary to give action-adventure genre stories momentum but the Surfer’s always seemed like a character who bore more than his fair share. Norrin Radd could do just about anything with near-limitless energies of the Power Cosmic but happiness and fulfilling interactions with other sentient beings always seemed to elude him. This week’s new Silver Surfer #1 is a continuation of a re-invention that began in 2014. In the run that started that year, creators Dan Slott, Mike and Laura Allred engineered a sci-fi meet-cute that tethered the Surfer to average everyday Earth-girl Dawn Greenwood. After rescuing Dawn from an evil resort planet powered by the heart of a celestial being, the Surfer took her on as a traveling companion. Dan Slott is a writer who’s been steering Spider-Man for more than a decade, and his work on Silver Surfer is among his very best. The very quality that initially made me lukewarm to Slott’s tenure on Spider-Man—a fan-turned-pro reconstituting all-too-familiar beats—seems to be the very thing that’s powering my enjoyment of Silver Surfer. There’s a ton of Marvel Comics literacy simmering under the shiny surface of the series’ peppy plots and dialogue, but it gets used in a different way. Most comics readers already know Peter Parker’s personality, and we know that Slott knows it, too. So, even while he’s making the newest take on Spider-Man feel more adult in cleverly appealing ways, there’s a sense of inevitability to it all. Peter becoming more responsible as he rises to greater heights of socioeconomic power? Of course. It’s reinforcing the commonly-held attributes of the character. 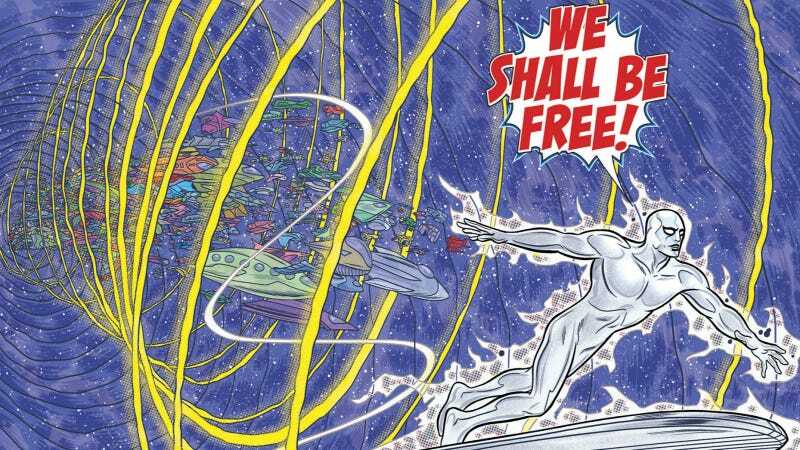 The arcs spooled out so far in Silver Surfer have felt fresher. Because the Surfer doesn’t have as weighted a publishing history as Spider-Man, the creatives on his newest series seem more free to take him into trippier, more bizarre outings. The stories and tone in Silver Surfer bear the heavy imprint of Mike Allred’s authorial touch. Allred—who shares storytelling credit with Slott—first came to renown on the strength of Madman, his wholly-owned superhero creation that tapped into a deep love for kitsch, Silver Age comics creativity and retro pop-art. The pair shared an even more existentially themed adventure during Secret Wars, one where they held the possibility to create the entire universe from their memories. The story climaxed with Norrin and Dawn having to choose between a perfect shallow reality made from their own hopes or a deeply flawed one filled with evil and past regrets. The new Silver Surfer #1 shows Dawn and Norrin returning to Earth and reconnecting with her family. On the way, they scuttle a would-be invasion handily, but the Hordax aggressors retaliate by leeching away all of mankind’s collective creative works. This first issue maintains the zippy and surprisingly poignant feel of the Slott/Allred run of Silver Surfer comics and doesn’t come off as a massively reinvented take on already extant characters. Superhero characters often say that every life matters as motivation but the sentiment rarely feels genuine in today’s bleak-outlook cape comics. In this creative team’s hands, Norrin Radd really feels like someone who thinks life is precious.